Tim Herron’s Practical Performance Handgun Class is well worth taking for competitive and self defense shooters alike. I had been looking forward to this class for some time, so I had goals and expectations going into the class – and all of them were met. However, the key thing to understand that the most important thing to get out of a firearms class, be it rifle or handgun, is knowledge on what you need to improve and how to improve it. While you may be slightly better after completing a class, the true proficiency increase comes down the line from practicing what was learned. While Tim Herron’s Practical Performance Handgun Class does have a competition focus, the material reviewed all had a practical application. This class isn’t about bullseye shooting – this class is about getting the needed hits as quickly as possible – which is perfectly applicable to action pistol shooting and self defense shooting. We covered topics like consistent accuracy, balancing accuracy and speed, watching our sights through recoil, moving while shooting, getting in and out of positions quickly, one handed shooting, and more. Tim Herron is hands down a fantastic shooting instructor. Not only is he friendly and fun, he knows his material and he knows how to convey the material. What’s more, is his shooting techniques have given him high placements at national level matches – so you know the material is worth practicing. Tim Herron’s Practical Performance Handgun Class is a two day handgun class focusing on getting acceptable hits as fast as possible when you have to move around and engage targets from different positions. Tim had us shoot a USPSA style 32 round pistol stage and he used that as a baseline to figure out our skill levels, we then shot the stage two more times on the second day. The first day focused on accurate and fast fire with some time spent on target transitions. The key to that is trigger control, solid sight alignment, and the ability to watch your sights through recoil. Tim had some excellent ways of conveying that information and there were plenty of lightbulb moments and lots of measurable improvement across the firing line. The second day focused on movement. It was a rather free-form second day which allowed us, the students, to pick what we wanted to emphasize. We broke down the shooting stage into different sections and figured out the best way to tackle them and what technique nuances thee were. It was extremely educational. Movement and getting in and out of position quickly are one of the biggest time savers on a shooting stage. One of the serious problems casual and competitor shooters put on themselves is a focus on the target instead of the shooting process. They worry about the hole they are about to put in paper or the holes they put in paper in the past. This kind of distracted shooting negatively impacts shooting performance. Tim really emphasized the importance f focusing on the shooting process in his Practical Performance Handgun Class. Focus on each individual shot as you are taking it. Not the shot you took a few seconds ago, not the shot you will be taking in a few seconds, and definitely don’t focus on the results you hope to make. Focus on the process for the shot you are in the middle of taking. In the same vein as focusing on process, we put a lot of effort into two important fundamentals – sight alignment and trigger control. Your sights tell you everything. If you can listen to what your sights tell you, you’ll know exactly where your shots are going to go. This allows you to avoid over aiming, call hits and misses, and time your follow up shots through recoil. We also reviewed a minimum acceptable sight picture and acceptable accuracy. Not every shot needs to be a tight touching group. We simply need to aim only enough to hit the target in front of us. In competition, that would be the A Zone – in self defense that would be high center mass. The other fundamental, trigger control, is critical to ensure our shots go where our sights are telling us they will go. With good trigger control, we can get fast and accurate shots. With poor trigger control we will yank shots and induce misses. Kinda obvious, but poor trigger control will make all other fundamentals of marksmanship fall apart. Ever heard of the El Presidente drill? What about the Blake Drill? The Blake Drill is essentially a simplified El Presidente. At the beep, engage three targets about one yard away from each other with two hits in the alpha zone as quickly as you can. 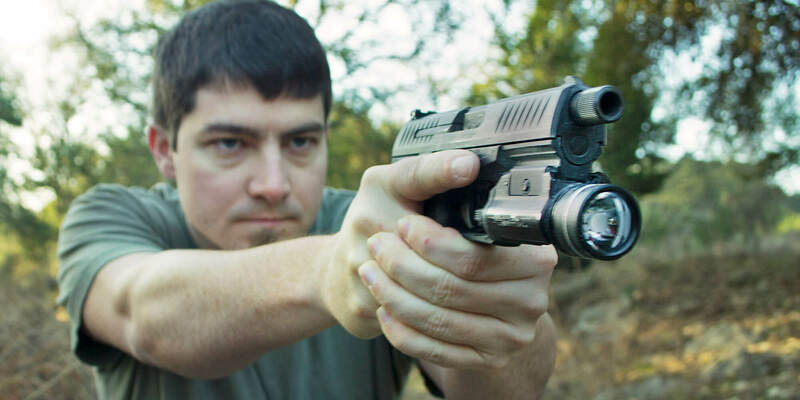 It’s a very simple drill, but mastering the drill is critical for shooting a USPSA stage quickly and has a similar importance for conceal carriers. What most people do is treat each target separately and will “double tap” three different targets. Then end result sounds something like “pop pop (pause) pop pop (pause) pop pop.” (This is difficult to convey over text) The proper way to shoot a Blake Drill is to have a continuous string of fire with even splits between the targets. Watch this older video of Tim running an El Pres drill. Pay attention to the shooting cadence. The shot split on a single target is barely different than the split between the two different targets. Try shooting the Blake Drill with an even cadence between all six shots. Then slowly speed up your shot cadence, but keep the splits even between all targets. The Barrels Drill is something of Tim’s own creation, and it was a lot of fun (partially because I did so good at it). Get two stacks of barrels next to each other with a gap in the middle and three targets beyond them. Start walking from one side to the other and engage the three targets with one shot each from one side of the barrels, the middle of the barrels, and the other side of the barrels for a total of nine shots. Like the Blake Drill, the key is to keep your shot cadence even between all 9 shots. It takes an even foot, smooth transitions, and no over travel with the gun. The second day of shooting was all about breaking down a stage Tim had set up. We took each of the different components and ran them over and over, analyzing our stage strategy and our shooting technique. It was a ton of fun breaking down how to approach everything, and we learned a lot about our shooting – particularly when it comes to combining movement and shooting. Like I mentioned, we ran the entire stage three times throughout the Practical Performance Handgun class, analyzing our shooting as we went. We found problem areas that individuals and the entire class had and dug into them deeper. The far back left array in particular was quite challenging. Here’s a video of Tim running through the stage we ran over the course of the weekend. It’s an obvious thing to work on, but it changes how you approach things when you put into practice. I have been fighting over aiming for quite some time. I’m getting better at that, but there’s room for improvement. I also need to work more on getting my sights up so I can start shooting as soon as the target comes into view. I’ve already been working on this as well, but I can do better. Listening to your sights is one of the most important components of practical pistol shooting, arguably the most important. Listening to your shots is how you avoid misses, it’s how you get make up shots, it’s how you know what a minimum acceptable sight picture is to avoid over aiming, and it’s how you control your shooting cadence based on the difficulty of the shot. I can do a lot of things real well, but I have more bad runs than I would like. Even though the bad runs are becoming more the exception, not the rule, they still happen more than I would like. This will go away through more and more deliberate practice. Tim Herron’s Practical Performance Handgun Class was an excellent, informative, fun, and safe pistol class. I learned a lot and have identified plenty to work on. Final note, big thanks to my father for coming out and joining me. It was an excellent father/son weekend. I’m so glad to be able to train along side my dad.